Our SDB World Fed Conference brethren in Andhra Pradesh, India were blessed with the donation of land in Yazalli Village to construct a place for worship. Due to the huge expense to construct a permanent building, they decided to complete a temporary structure and solicited partnerships to realize that plan. The building was projected to cost approximately $1,200. 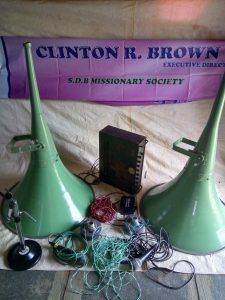 They accumulated what they could from among themselves and with your support they were able to construct the Yazalli SDB Worship Facility and with funds left over, purchased a microphone system to be heard in the congregation and in community evangelism. We give God all the glory! Once again, In India SDB church members are conveying (gratitude) to all who helped with this money, who sent, and he who recommended. [SDB Pastor Paulchukka, Andhra Pardesh].